David Meerman Scott, an online leader, strategist, and author of five marketing books formulated a list of 5 different guidelines for ethical Social Media Marketing. The list below was gathered from this post from Marcom Professional. 1. Transparency– If you aren’t open with your consumer on exactly who you are, it can come back to bite you. Consumer’s don’t like to be lied to and with social media, it could be easy to hide your identity. Showing the real person behind the ideas coming from the computer screen is key. 2. Privacy– If you’re given inside information, don’t let the whole world know through social media. Once a secret’s let out… a whole campaign could be ruined! 3. Disclosure– Let people know truthful information that they may find trouble with in the future. 4. Truthfulness– Always, always, always tell the truth. Don’t fabricate or elaborate anything. 5. Credit– Give recognition to those who help out or contribute to your ideas. Giving others credit makes your ideas seem more like a team rather than a single opinion. Teamwork makes the dream work. To give you more insight on David Meerman Scott, I’ve posted a video where he explains his path into social media. This week in our public relations class, we learned all about public relations and the law. After reading this blog post about 3M from Marcom Professional, I understood the need for social media ethics. 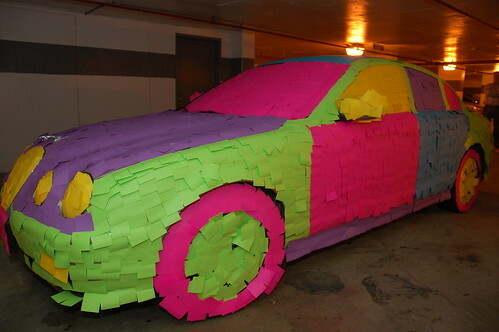 In this post, the author David Meerman Scott, explained that as a joke, a man named Scott Ableman and his colleagues covered their friend’s car in 4,000 colored post-its from 3M. The photos were viral and were viewed by millions on Flickr. Because of all of the free publicity that it attracted, 3M decided to use it in its back to school campaign- without giving credit to Ableman. 3M mimicked the idea, took their own pictures, and used them in their back to school marketing campaign. 3M should have paid Ableman and his colleagues or at least put their names somewhere on the marketing campaign to give them credit. As the David, put it… This campaign turned a “World Wide Rave” into a “World Wide Rant” . For my public relations class, we were asked to look at major brands on Facebook. I chose to look up popular brands that make products that many Clemson University students wear and use. The three brands that I looked up were: The North Face, Patagonia, and Mountain Hardware. Out of all three, Mountain Hardware’s page was the least put together. Patagonia’s Faceboo k page has over 6,500 fans. On its wall, Patagonia shares news stories about earthy subjects that are geared more towards their clientele. Fans of Patagonia write mostly positive feedback on its wall. Under it’s INFO tab, Patagonia lists its Web sites, background information, and the products that it produces. In its PHOTOS box, there are outdoorsy pictures of nature. Interestingly enough, there are very few pictures posted that include the Patagonia label. Patagonia has a YOUTUBE tab where it features outdoor activities that would be interesting to their fans. The North Fac e fan wall is similar to Patagonia’s except it has five times more fans than Patagonia’s. The North Face fan wall shares Facebook notes about a climbing excursion of a 5 man team. They also have fans that write positive feedback and promote events that will be happening in stores that carry North Face products. Under it’s INFO tab, The North Face fan page has multiple Web site and the products that they sell. With the other tabs, The North Face fan page is very similar to the Patagonia page, but they do not have a YOUTUBE tab. In addition to the regular tabs, they have an EVENTS tab that lists the upcoming outdoor activities that The North Face is hosting. The last fan pa ge that I looked at was Mountain Hardware. The fan page has less than 300 members and only has 3 tabs to explore the site with. A few fans have written on their wall, however there have been no posted articles or upcoming events by Mountain Hardware. The information in the INFO tab lists one Web site and the major designers and their backgrounds. There are few photos that are under their PHOTO tab. This fan page is the worst out of all three because of its lack of ingenuity and information. The site isn’t geared towards it’s fans and doesn’t try to connect on a personal level. Is Twitter Compromising our Legal System? I recently started following Kara Smith on Twitter and reading her blog, Karasma Media. I came across one of her posts this past week about how Twitter is effecting our legal system. In her post, Kara talks about how jurors are starting to tweet and sending updates about trials as the trials are still in session. That court case was considered a mistrial. She also talks about how a juror “Google Searched” a defendant during a trial. With all of this new technology and social media, secrets that once were kept hidden can now be found within a matter of seconds. Do you think that something needs to be done about social media in relation to our legal system? For my stakeholder comm class, we were asked to look at 15 different well known companies and analyze their efforts on Twitter. We were asked to look at what they tweet, how often they tweet, who do they follow, and the transparency of the Twitter account. Out of all of the brands, I think that the Twitter account @SharpieSusan was one of the most effective. @SharpieSusan was very transparent. In her short bio, she briefly explains her goal of the Twitter account: Leading the charge on PRSM (public relations social media) at Sharpie. Her following/followers ratio only differs by 100. She tweets feedback about Sharpie to people who tweet her. She also tweets about Sharpie ideas and products. While most of her tweets are about Sharpie, what makes her seem more likable and personable are her tweets that don’t mention the brand. I think that with her diverse tweets, good ratio of followers/following and transparency, @SharpieSusan is effectively using her Twitter account.